Charles (Charlie) Jessup grew up on Long Island about 100 miles east of New York City, although all of his relatives came from the Boston area. He began playing the flute in the 6th grade and continued playing throughout junior high, high school, and college. Initially after high school Charlie went to college in his home state of New York, but he then transferred to Indiana University in Bloomington, Indiana to attend optometry school. Indiana University also happened to have a fantastic music school, and Charlie attended many wonderful concerts there. He also played in the local community orchestra, the Bloomington Symphony. He received his doctor of optometry degree in 1971, when the Vietnam War was raging. He joined the Air Force, and that brought him to the Kansas City area. Charlie was the base optometrist at Richards-Gebaur Air Force Base in Belton, MO for two years. He really liked the Kansas City area, so he decided to stay. 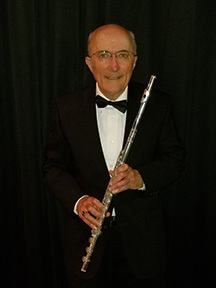 While he was in the Air Force, Charlie began to take flute lessons with Jim Hamilton, who was one of the flutists in the Kansas City Symphony and one of the major flute teachers in the city. He studied with him for ten years. Charlie has been a member of both the Kansas City Civic Orchestra and the Overland Park Orchestra for over forty years now. He has been a flute soloist for various churches and played for weddings and receptions. More recently, he has developed concerts at nursing homes, focusing on music from the 1920’s, 1930’s and 1940’s. In addition to being a musician and optometrist Charlie is also bilingual (he speaks French), and he enjoys hiking and photography. Help us serve you better by completing our quick survey.